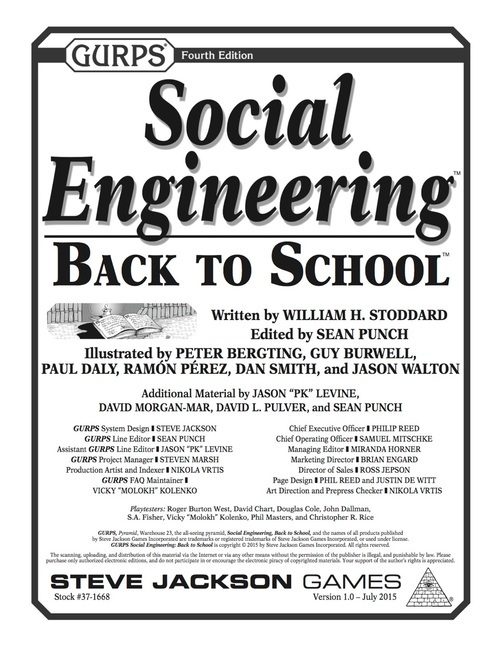 While not completely unexpected Social Engineering – Back to School is certainly a welcome addition to William H. Stoddard’s oeuvre. Even more welcome is the fact that it weighs in at the same size as Locations – Worminghall, which it complements nicely without being a bona fide companion volume. It is, however, a bona fide Social Engineering supplement down to the tile (sorry, Boardroom and Curia, but it’s the name that tells). So what does it offer? Back to School is the go-to book for GMs who want to set a campaign at a school, dojo or bootcamp and not just tally the hours spent there. It expands considerably on the rules for learning presented in Characters. Readers of Worminghall will find some familiar titbits like the study roll, but the rules here are far more comprehensive and the tweaks suggest some serious playtesting. Also some of the contents are really unexpected – though always in a good way. Unsurprisingly, the book is very rules-focused. At the same time it does offer considerable insight in common social situations and ways in which teaching and learning might crop up in a game. Like with Social Engineering itself that makes the distinction on whether the book deals mainly with rules or plot ideas a bit fuzzy, but in the end the rules are certainly have the lion’s share. Readers who liked the mother volume of the series will also like this one, unless they really don’t like learning in their games. As the title suggests rules and ideas for school settings make up a big part of the book, but even if you aren’t running Harry Potter with the serial numbers filed off, you will get quite a bit out of this book. Apart from one-shots there’s hardly a campaign that won’t benefit from at least some of its contents. Okay, there aren’t any gold-for-skill rules like those you find in Dungeon Fantasy, but that’s about it. The book is divided into four chapters: The first deals with teaching from a student’s perspective and comes in at eleven pages. The second does the same from a teacher’s perspective and is ten pages long. Relevant traits, skills, techniques and methods are split between both these sections. The split is useful for when you have a certain focus in mind for your campaign, but makes it a bit more difficult to find what you were looking for if you want to represent both the students’ and the teachers’ point of view in your campaign. The third chapter deals with schools as organisations and takes up nine pages. This makes use of mechanics taken from Social Engineering itself as well as Boardroom and Curia and Social Engineering – Pulling Rank, though its main focus is on relationships, situations and structures. The final chapter deals with campaign ideas and is only three pages long without any rules. This is rounded off by a handy two page appendix that lists all the standard learning times and all the traits that affect it, two pages of bibliography and a two-page index, both of which are nice and thorough. Practically everything that could concern learning is touched upon. Finding teachers or schools, using unusual teaching situations or materials, the effects of various traits on teaching and learning, but also spells, special abilities, futuristic and realistic drugs, legendary teaching and how to price a school as a patron (and what that means for its facilities, staff etc.). The most useful rule by far is the study which replaces automatic gain of valuable study hours by something that is influenced by each student’s character sheet. Now that comprehensive treatment is just what you’d expect when Mr. Stoddard tackles a subject, but there’s more. We learn new things about skills in general and how their transmission is affected by tech level, language comprehension and available facilities. The author also manages to plug a couple of annoying holes in the basic set. No longer is it possible to just drop 16 points in a spell “because I used it in game”. Skill use under pressure is certainly one of the nicest rules fix for this very reason. I also appreciate that learning is now affected by Laziness (which used to be free points for mages). Surprisingly enough you’ll also find comprehensive rules for brainwashing (and -hacking) in the section on “Coercive Teaching” that’s sure to please all the Snape fans. That together with spells and powers for teaching and studying round the subject off in satisfyingly universal way. For a meaty book there’s certainly a lot of soft cheesy material here. While the first two chapters are certainly rule-focussed they also provide lots of bits to build your own setting. The rules take a back seat in chapter 3, although the rules-conscious social engineer won’t be disappointed there either. The chapter basically covers all the bases when it comes to designing your own base for teaching including the owners and their motivations. True, it’s not exactly the cheese lovers paradise, but it’ll get you far. Chapter four may be a bit short with only three pages, but more unusual ideas in there (like the invaded house trope) will certainly prove inspiring to GMs. Personally, I will start cribbing for my own magic school campaign as soon as I finish this review. The bibliography also provides some pointers for inspiration and it is a welcome change of pace that even smaller books like this one get a bibliography now. The only jarring thing is that the only mention of Terry Pratchett is in a pull-quote. On the whole the book has a lot to offer on the dramatic side of things too. Just what you’d expect from it being part of the Social Engineering series. Compared to some of the recent GURPS releases (Zombies – Day One I’m looking at you), the art of Back to School is actually pretty good. Not perfect, but fitting and refreshingly non-ugly. While I have the feeling that at least some of the images have been reused I cannot trace them back to specific locations. Most of them are very focused on books and sometimes it’s hard to tell how they’re relevant to the section they’re in, but they’re certainly inspirational. The image on page 36 makes me want to run an illegal education of the masses campaign for a steampunk setting. It’s a bit of a pity that the title page is really uninspiring, but the mass of text in the title excuses that shortcome. The editing, while still above industry standard is not quite up to GURPS standards. There are a couple of minor errors in grammar and sentence structure that cropped up even on my first reading. They’re most likely due to rearranging text blocks, but they do distract a bit. Also distracting is that some of student/teacher traits show up in the wrong chapter, for example there are a couple of spells that are clearly geared towards students, but show up under teachers because there is no section for spells in student chapter. Minor, but not perfect. Now, I know I talked a lot about schools in this review, but this book isn’t just about that. It also deals with dojos, monasteries, universities, on-the-job and vocational training, military boot camps, apprenticeships, tutoring and ‘schools for gifted youngsters’. It’s not only for the Harry Potter and Buffy the Vampire Slayer crowds. Back to School has rules for teaching by gesture (“Anybody wants to play pre-verbal stone-age tribesmen?”), by lecturing, by telepresence and by immersion into virtual realities. It gives you a version of Blessed that’s the mythical equivalent of Weapon Master for teachers. It shows you how to rehearse in your dreams, use illusions during teaching, help your students by reading their minds and how to make your own teaching materials. Within the subject matter you cannot be more generic. If Back to School were a print-only book, it would get an easily accessible spot on my GURPS book-shelve. You might not need it all the time if you’re running a regular high fantasy, cop drama or space opera, but it will be useful time and again. For campaigns where learning is the actual focus, be they set in some anime universe or in Hogwarts, the book is absolutely invaluable.